Rocky Mountain Vintage Racing is a non-profit club who are vintage racing enthusiasts. 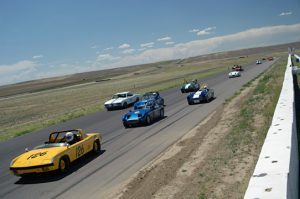 The club’s primary focus is the organization, production, and sanctioning of vintage car races in the Rocky Mountain region. They have over 500 eligible cars which include Austin Healey, Corvette, Lotus, MG, Mini, Porsche, Triumph, Formula Ford and Formula Vee. As well as some more exotic and perhaps lesser known names such as McLaren, Lola, Abarth, Morgan, Siata and Zink. Many RMVR members including current club President Frank Albert are supporters of Auto-Archives and they have donated a large amount of materials.